Who wants to win a bag of the brand spanking new product from Enjoy Life Foods? The Dark Chocolate Morsels that are gluten free, wheat free, dairy free, soy free, peanut free, tree nut free, egg free, fish free, and shellfish free are now up for grabs! 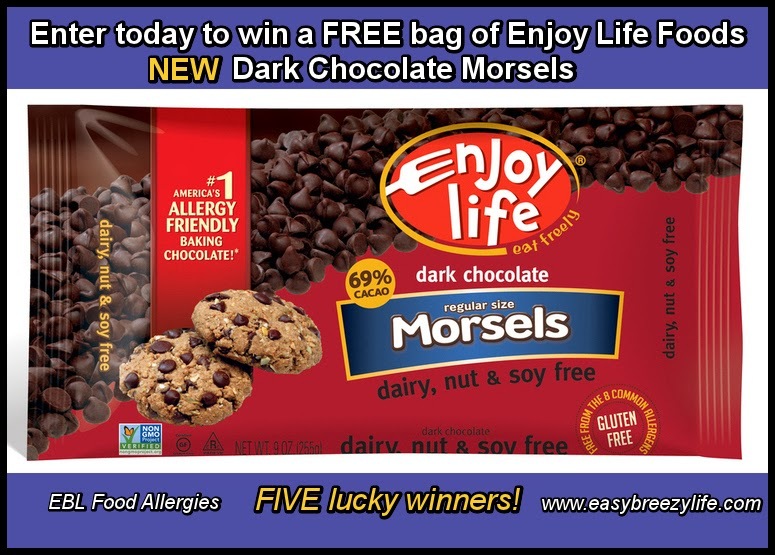 I will be sharing a give-away below for one bag of Enjoy Life Foods Dark Chocolate Morsels to FIVE lucky winners!!! I received my complimentary bag of Dark Chocolate Morsels in the mail today and I could not wait to use them. Did you know there are actually health BENEFITS from eating dark chocolate? I cheated with my cookie recipe by using King Arthur Gluten Free Cookie Mix. (I’ve been doing that a lot lately…shhhhh…don’t tell) I followed the directions on the back of the box and made some substitutions to make it allergy free for us. I used Spectrum Organic Palm Shortening in place of butter and Ener-G Egg Replacer in place of egg. For add-ins I used raspberry & dark chocolate morsels, coconut & dark chocolate morsels, and raisins & dark chocolate morsels. Now, onto the GIVEAWAY! There are FIVE bags up for grabs. One winner will be announced every five days. The numbers on the right side of the giveaway is how many times your name gets entered into the drawing. You may enter every single day, so don’t forget to come back! Good luck and keep an eye out on my Facebook Page and Twitter for the winner announcements! Congratulations to Terri for winning the first package of NEW dark chocolate morsels!!! P.S. I made this little vine while creating the allergy free cookies…not my best work but hey, I was multi-tasking! Sure would love to win some yummy dark chocolate. Yummy!! I enjoy these as much as my daughter lol! Gorgeous photo! Grateful for Enjoy Life products – especially the chocolate chips. I LOVE Enjoy Life & I LOVE that they are coming out with new great products!! !